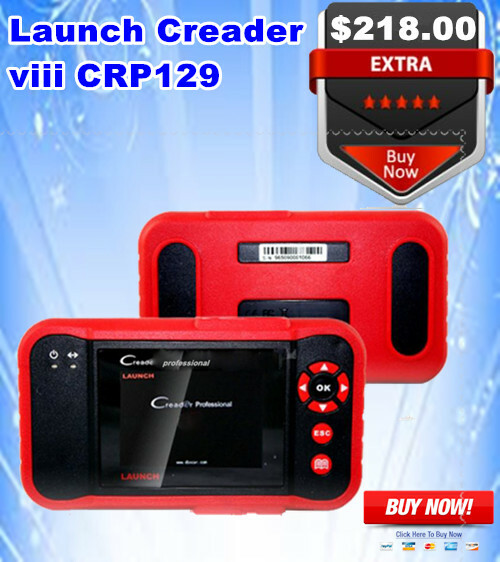 Launch Creader CRP129 is the newest . released code reader by Launch. It combines the functions of Launch CRP123 ! Special function: Engine oil light reset, Reset brake block(this function only for BMW now), Correct steering angle sensor(this function only for Landrover now) and so on. In October, 2012, LAUNCH released a creative, simple and practical Creader Professional CRP123, which leading the auto after-market. Encouraged by this hot sale in market, on April 15th, 2013, carrying forward the classics of Creader Professional 123, LAUNCH released world’s first small DIY device integrated with maintenance and service, named as Creader Professional 129. 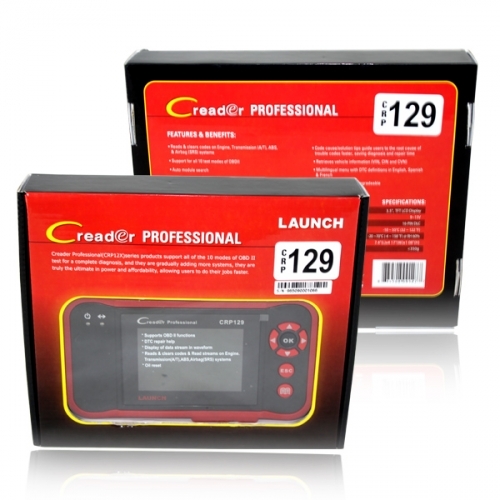 Creader Professional 129 is a highly cost-efficient small diagnostic device specially developed for car DIY lovers, small repair workshops and roadside concessions. Fashionable appearance, human-oriented operation interface and powerful function, all these make it possible to do maintenance and service anytime anywhere. The most attraction of Creader Professional is just about the X-431 classics. CRP129 is a well built comprehensive diagnostic instrument by Launch. It’s not only including full function of OBDII /EOBD, but also support more functions of four systems (Engine, automatic transmission, anti-lock braking system and airbag) of main car models, such as read and reset code, multi-languages, data stream graphic display, storage and playback of dynamic data stream, and able to provide special functions, such as engine oil light reset, reset brake block, correct steering angle sensor. Launch Creader Professional 129 was born from the need for an ultra-fast code scanner that has deep sub-system coverage, along with full PID data capturing and graphing capabilities, in a price point that Launch CRP 129 is a fraction of a professional scan tool. Launch Creader Professional 129, features OEM enhanced functionality one might expect from a bigger scan tool. Functions include electronic parking brake release, steering angle reset and service reminder reset not to mention the ability to display and graph live PID data for A/T, SRS and ABS, along with complete generic OBDII. The tool includes quick boot up, manufacturer-specific code definitions, DTC-specific troubleshooter tips, free Internet updates, and the ability to print via PC. The Creader Professional 129 is the latest in a line of award winning code scanners from LAUNCH the Global Leader in Diagnostics. The Launch CRP 129 blurs the lines between a code scanner and a professional scan tool with features such as electronic parking brake release, steering angle reset, and service reminder reset not to mention the ability to display and graph live PID data for A/T, SRS, and ABS, along with complete generic OBDII. The CReader Pro CRP129 also has the fastest boot up and DTC read & clear functionality on the market. As with all LAUNCH code readers, manufacturer specific code definitions are built into the tool. Also included in the tool is a troubleshooter that lists top causes for DTCs – helping you tackle the job right the first time. Other features include the ability to print via PC and free internet updates. The CReader Pro CRP129 will read and clear DTCs for engine, A/T, SRS and ABS. Additionally, it will also display and graph live PID data for those systems, along with complete OBDII generic functionality. The ability to reset service maintenance lights both automatically and manually along with steering angle resets and electronic parking brake release also lend this tool to many applications for today’s technician. 6 Support 4 Systems: Engine, Transmission, ABS, and Airbag. 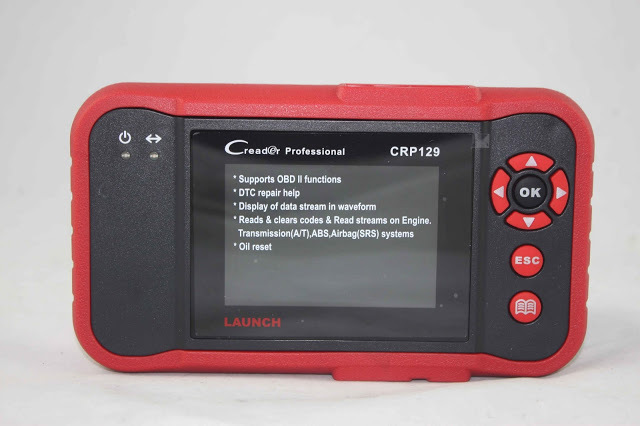 Launch CRP 129 will help the technician diagnose issues with engine, transmission, SRS and ABS. It will reset DTCs within these systems. Code definitions and most likely causes for the codes will also be available from within the tool itself. According to Launch Tech, no other product in the CReader Pro price point offers EPB release, steering angle reset and service reminder resets. This code scanner also offers the full ability to display and graph live PID data for A/T, SRS and ABS, along with complete generic OBDII.